So, another Tuesday, another review, but this time a report on the first MNFC democratic revolution! It seems that the majority of MNFC-ers fear democracy, or are experiencing some kind of Stockholm Syndrome with regard to our usual fascist dictatorships, as there were only 4 brave souls present to carry out our experiment in democracy. Undeterred, we not only exercised our democratic right to vote, but took it one step further by using the AV system to good effect! After the first round of voting failed to produce a clear winner, in spite of Comrade Love lobbying strongly with the aid of chocolate eggs for all voters, we went to round 2. The film that came out on top was The Breakfast Club, making Comrade Grayson the victor, and first democratic President of MNFC. The film is considered to be one of the defining films of the 80s, and was directed by the legendary John Hughes, who was also responsible for the work of genius that is Ferris Bueller’s Day Off. 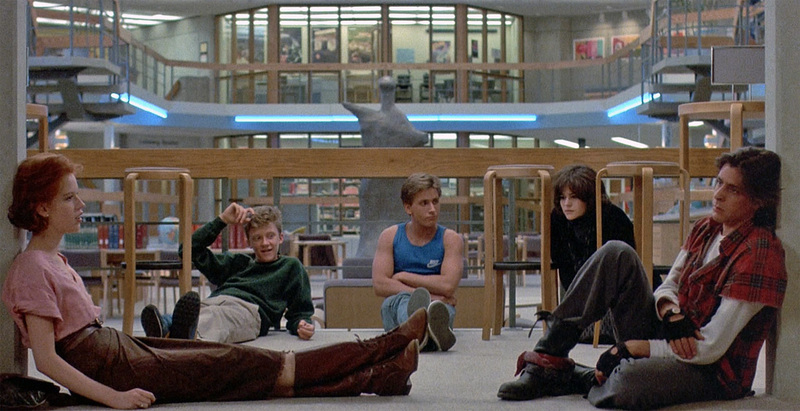 For those of you unfamiliar with The Breakfast Club (shame on you! ), it is about 5 high school kids spending a day in detention. Trivia hounds/geeks will be interested to know that the high school used as a filming location for the film was also used as the school in Ferris Bueller’s Day Off. For those of you who want more random facts, there are plenty to get your teeth into here. All in all, our foray into democracy was a success, and should be considered for future Mondays. In the meantime, the return to dictatorship will take place on 9th May at Helen R’s house. She will send out details when she gets back from Peru in a couple of weeks. Thanks for another great MNFC, and a great Tuesday review. I didn’t know what to do at work on Tuesday whilst I was waiting for it! Am amazed that despite all the 80’s campness and nostalgia, we actually settled on a film with a certain degree of poingnancy and managed to have some chats about it too. Of course, I’m still gunning for Stand by Me, but that’ll have to wait until my coup de tat takes over again another monday some time in August I expect. Plus, there’s still Jurassic Park to get through first of course. And with that cheery thought, looking forward to Battersea and Helen’s selection in a few weeks. Big love to all fascists everywhere.